Boston Marathon Bombing suspect Dzhokhar Tsarnaev, 19, is pictured in an undated FBI handout photo. The Justice Department has notified a federal judge that it intends to seek the death penalty if a jury convicts Dzhokhar Tsarnaev for last April’s bomb attacks at the Boston Marathon. Tsarnaev is awaiting trial on charges that he and his brother built and planted two pressure-cooker bombs that killed three people and injured at least 260 others. He is also charged with killing an MIT campus police officer. Liz Norden, the mother of Boston bombing victims, responds to news that the Justice Department will seek the death penalty against Dzhokhar Tsarnaev if he is convicted. Among the factors listed by the government were that the killings were intentional, resulted from acts calculated to cause grave risks to public safety, and were committed in a cruel manner. And prosecutors said the defendant has demonstrated no remorse. Liz Norden, the mother of two men who lost legs in the bombing, praised the decision. "You know, it just makes me relieved that the attorney general believes that it was a terrorist attack or it's the death penalty and we support the decision," Norden told MSNBC's Craig Melvin. She noted that the Justice Department officials talked to victims' families before reaching the decision. While most legal experts predicted the Justice Department would seek the death penalty, the decision will be somewhat controversial. A poll conducted in September for the Boston Globe found that 57 percent of respondents favored a sentence of life without parole if Tsarnaev were to be convicted, while 33 percent thought death would be the appropriate punishment for the government to seek. 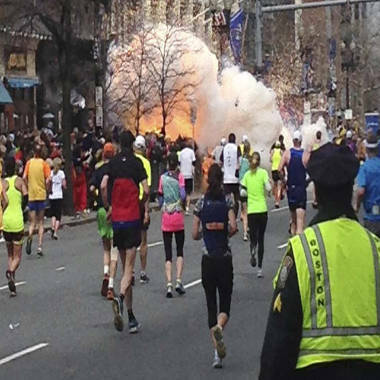 Explosion at the Boston Marathon, April 15, 2013. Executions in the federal system are rare. In the modern era of the death penalty, since the U.S. Supreme Court forced a change in sentencing laws in the mid-1970s, the federal government has carried out just three executions. Timothy McVeigh was put to death in 2001 for his role in bombing the Oklahoma City federal building in 1995. The most recent federal execution was more than a decade ago. In the event of a conviction and a recommendation of a death sentence, the execution by lethal injection would be carried out at a federal prison in Terre Haute, Ind. A trial date has not been set for Tsarnaev. His next hearing is Feb. 12. Legal experts have said that seeking the death penalty against Tsarnaev could give him an incentive to plead guilty to avoid being put to death. Boston Marathon Bomber suspect Dzhokhar Tsarnaev faces the death penalty.